In Theory of the Border, Thomas Nail looks at the constitutive role played by different types of border regimes – fences, walls, cells and checkpoints – in constructing societies across history as part of his broader ‘kinopolitics’ centred on movement, with focus on the Mexico-US border. While this wide-ranging book offers less a theory of the border than a taxonomy based on historical, largely European border regimes, Alex Sager nonetheless welcomes it as an ambitious, rich and suggestive work that has much to offer political theories of migration. Theory of the Border. Thomas Nail. Oxford University Press. 2016. Borders define our lives. Private property rights protect our homes from unwarranted intrusion. Roads and sidewalks facilitate movement and set limits on where we are permitted to go. Security checkpoints mark entrances to government buildings or airports. Authorities allow passage or exclude and detain by inspecting drivers’ licences, passports and social security cards. Barbed wire fences and maritime patrols redirect migrants who lack the documents that would allow them to pass freely through authorised routes. For too many people, cell walls detain them until their prison sentence ends or a judge decides their asylum hearing. These borders are constituted by laws, police, judges, bureaucrats, social customs, symbols and physical barriers. Despite – or perhaps because of – the ubiquity of borders, they are poorly understood and surprisingly difficult to define. 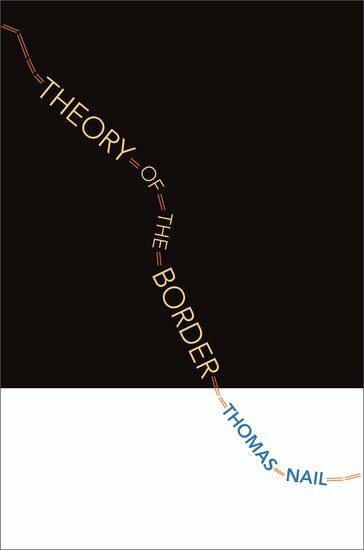 In his ambitious and wide-ranging Theory of the Border, Thomas Nail seeks to provide a systematic theory that spans territorial, political, juridical and economic borders. It is part of a larger effort to establish a ‘kinopolitics’ – a theory of movement. It complements The Figure of the Migrant, Nail’s important attempt to construct a political theory in which the migrant, rather than the citizen, is the integral figure. Theory of the Border investigates the nature of borders that arise through processes of expansion and expulsion. Theory of the Border is divided into a theoretical chapter outlining the types and functions of borders, a philosophical history of the border and a detailed application of the theory to the US-Mexico border. Nail understands borders as processes of social division that constitute, and are simultaneously constituted by, our societies. Borders are not static, but rather move as a result of political conflict, economic and juridical reforms as well as resistance from migrants and changes in the physical environment. Their function is not simply exclusion and inclusion, but also redirection and circulation. Borders expel, expand, bind and delimit. Nail locates each type of border power – the fence, the wall, the cell and the checkpoint – in a historical period in which it emerged or dominated. Yet, he also qualifies his account, admitting that all of these types may be present in some form in earlier periods and that they often co-exist. Nail defines fences as holes in the earth filled with vertical stones or wooden stakes that date from around 10,000 BCE. Under ‘fences’, he includes corrals, palisades and monuments. Their function is centripetal, directing flows from the periphery toward the centre. Some of the earliest fences were graves or tombs to which the living would periodically return. Neolithic kites funnelled wild animals toward hunters or herders. Fences did not require centralised power. Instead, they provided the conditions for early cities (c.3000 BCE) to consolidate resources with walls. Walls, defined as stacked bricks, provided defence for cities, allowing them to resist conquest and to redirect resources for warfare and trade. Nail understands ‘bricks’ as any material produced through standardisation, including people, so that ‘walls’ include not only citadel walls, but soldiers, military grids, siege towers, roads and ports. Cells, in turn, emerged in Europe during the medieval period to divide and link individuals. Under ‘cells’, Nail includes rooms in monasteries, prisons, hospitals and asylums as well as passports, timetables and letters that establish identification and jurisdiction. Finally, checkpoints emerged during the modern period with the rise of statistics to allow for inspection at any point at any time. These include police patrols and spies, private property and national borders as well as informational checkpoints that gather, classify and analyse data. These middle chapters offer many insights – but how do these varied types of borders and their functions hang together? The border technologies Nail categorises under fences, walls, cells and checkpoints have intriguing similarities, but also crucial differences. A kite and a monolith may both involve placing vertical objects in holes in the ground, but one allows hunters to herd animals to their deaths while the other guides travellers or preserves collective memories through communion with ancestors. Siege towers allow soldiers to breach citadel walls; roads are useful for war and policing, but also for trade. Passports mark national membership. Prisons confine and punish segments of the population defined as deviant. When we move from Nail’s broad categories to an analysis of specific technologies, the processes of exclusion, inclusion, consolidation, selection and redirection do not map in any straightforward way onto his four categories. In fact, Nail does not offer a theory of the border, at least insofar as we understand theories as offering explanations or predictions. Rather, what he provides is a taxonomy of different types of border technologies that he derives from his understanding of different (mostly) European historical periods. His book gives little guidance for determining when these technologies will emerge, what will motivate them, who they will target and how they will combine. The limits of his analysis become apparent when he applies his theory to contemporary borders using the US-Mexico border. Nail classifies technologies used by the US as fences, walls, cells and checkpoints. He notes that the US-Mexico border technologies do not only include or exclude, but also redirect movement through customs inspections and through detention and deportation. Their purpose is to slow and halt securitised flows (e.g., of illegalised migrants) while simultaneously facilitating economic flows. The effect of increased border enforcement has counterintuitively resulted in more immigrants in the US territory. Immigrant and Customs Enforcement (ICE) raids can occur anywhere. They combine with immigrant detention and deportation to discipline and deter migrants through collective punishment, ensuring that those who remain are docile workers. Sometimes Nail’s analysis provides striking analogies. The crosses covering the US-Mexico border wall to mark the deaths of migrants recall Neolithic graves lining roads, though it is unclear if they have the same meaning or function. Nail compares the US-Mexico border to a ‘two-thousand-mile desert kite’ in which ‘migrants are expelled from their homes and centripetally funneled by a fence structure into a chosen pit for extermination (by dehydration or hypothermia), capture (by the Border Patrol Search, Trauma, and Rescue Unit, BORSTAR), or accumulation (into the United States)’ (173). Nonetheless, most of his insights are independent of the theory elaborated in the middle chapters. Finally, the book’s neglect of agents that construct and contest borders is striking. For example, Nail writes that ‘the border is the result of a negotiation between states and even between states and nonstate forces’, and that ‘the US-Mexico border remains an open and disputed nexus between territorial, state, legal, and economic forces, irreducible to one side or the other’ (168). Nonetheless, these chapters are curiously silent about the role of Mexican agents – or, for that matter, people on the US side of the frontier. This is partly a result of the decision to tackle the discussion of migrants and their resistance to border controls separately in The Figure of the Migrant. Still, what are the roles of politicians, employers, migrant rights groups, border enforcement agencies, police forces and community associations? Borders are the ambiguous, fluctuating, accidental and ephemeral consequences of many people’s actions. Some of these actions are intentional, but with unforeseen byproducts. Other effects of borders are neither intended nor imagined. Any attempt to theorise borders is incomplete without taking into account how people both succeed and fail in constructing their communities by establishing borders. None of these remarks should detract from the significance of Nail’s project. Theory of the Border remains a rich and suggestive work that opens avenues for future research that may very well set the agenda for the political theory of migration. Alex Sager is Associate Professor of Philosophy and University Studies at Portland State University. His edited collection The Ethics and Politics of Migration: Core Issues and Emerging Trends (Rowman & Littlefield International) appeared in October. He blogs at https://alexsager.blogspot.com/ Follow him on Twitter: @aesager. Read more by Alex Sager.